Specialty: Super High School Level ??? An enigmatic, silver-haired girl whose high school talent is unknown. Though aloof and slow to trust others, she's adept at noticing things which the other students don't, which proves vital once bodies start turning up. She often advises Naegi on conducting investigations. Apparently, she's trying to retrieve something that Monokuma stole from her in the past. As it turns out, the reason why her talent is unknown is because she cannot remember it due to amnesia. When the masked stranger attempts to kill Naegi, she prevents the attack, which makes her a suspect once the masked figure's body turns up. She gets executed by Monokuma in the bad ending, unless Naegi decides to trust her. It later turns out that she's actually a Super High-School Level Detective, and that she's the daughter of the headmaster of Hope's Peak. Kyouko was one out of the six who survived the final trial and escaped from the school at the end of the first game. 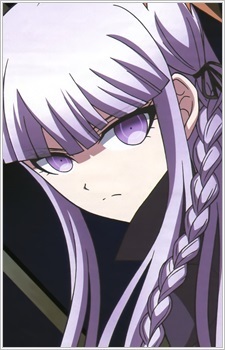 Kyouko is one of the 5 survivors of the final killing game and she is last seen running the new Hope's Peak Academy alongside its new headmaster Makoto Naegi.